Hal speaks of the Lyrids meteor shower coming April 22nd. 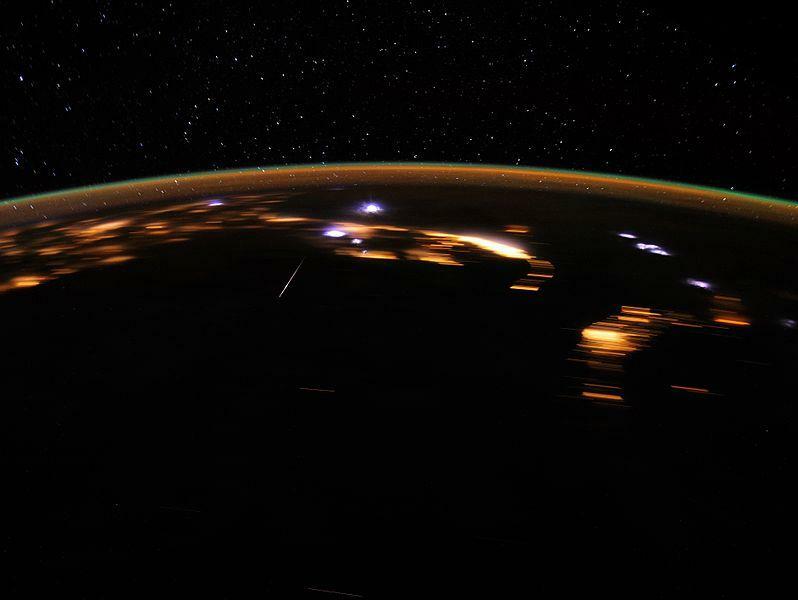 On the night of April 21, the 2012 Lyrid meteor shower peaked in the skies over Earth. While NASA allsky cameras were looking up at the night skies, astronaut Don Pettit aboard the International Space Station trained his video camera on Earth below. This week on Looking Up Hal talks about April showers of a different sort - the Lyrid meteor shower. 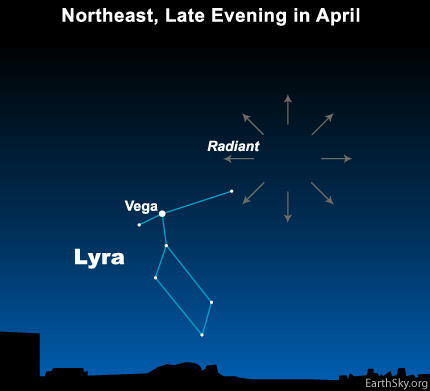 If you are an early riser, or a stay-up-all-nighter, the pre-dawn hours of April 22nd have a special show ready for you – the annual Lyrid meteor shower. The Lyrids, which will seem to come from NE portions of the Southern Colorado sky, are not the most spectacular meteor shower, with only about 18 meteors per hour. But they are beautiful because they tend to rocket across the sky very quickly, and some leave glowing trails in their wake. Some have been bright enough to cast shadows on the ground. The Lyrids are also distinctive for other reasons as well. They are the “oldest” meteor shower, in that the first records of them blazing across the sky come from Chinese astronomers over 2600 years ago! The meteors come from the debris left behind by Comet Thatcher, which circles the sun every 415 years or so. Every 60 years or so, the Earth’s orbit smacks directly into the main part of the debris trail. That last occurred in 1982, when astronomers saw up to 90 meteors per hour. But every now and then, it gets even better. In 1803, up to 700 per hour were noted, and the grand champion is 687 BC, when Chinese observes said “the stars dropped as rain.” Not bad for a bunch of dust and dirt. If you’d like to take a closer look at the Lyrid Meteor Shower or any of the wonderful and amazing things in the sky, please visit csastro.org for a link to information on our monthly meetings and our free public star parties. A new month is upon us, and Hal, our stellar court jester, makes a valiant attempt at a little bit of astronomical humor on this edition of Looking Up. Winter is slowly slipping away, and so I’d like talk with you about one star soon to disappear in the west, the winter star Aludra, in the constellation of Canis Major, the big dog. Bruce Bookout carries the weight of this week's episode of Looking Up in which four majestic stars come together for something special. Why? Because we want you to know how ancient cultures viewed the night sky. Around 3000 BCE, the Persians looked at the sky saw kingliness. They had four stars they considered “Royal Stars”; Aldebaran, Antares, Fomalhaut and Regulus. Doggonit! Another star that seems to be fusion reacting itself right outta business. This week on Looking Up we learn about a distant star that sure could use a leg up on finding another supply of hydrogen for its core. If you have been thinking that these Looking Up segments are increasingly going to the dogs, I must agree, at least about today, because I want to tell you about a neat star in the constellation Canis Major, or the big dog, that follows Orion the Hunter across the Colorado night sky right now. The special star is Mirzam, the right front leg of the big dog, below and to the right of the brightest star in the sky, Sirius. On this week's episode of Looking Up we hear about two familiar constellations and what they have in common. We’ve talked before about most everyone’s favorite winter constellation, Orion the Hunter. We’ve also talked about Taurus the Bull, who is the target of Orion’s hunt. And today, I want to talk with you about a cool star in Taurus that is visible in the Colorado night sky right now. Hal gives the Martian weather report. Good news/bad news on this week's episode of Looking Up. Now you can check the weather before your trip to Mars, but you probably won't like it. We are, or at least I hope we are, nearing the end of a long and cold winter. I for one do not like cold temps, but I do like what a great job the national weather service does in keeping us up to date on the weather forecast. Today I want to tell you about a very different weather prediction site that is available to you, over at nasa.gov.